Living and working in Evanston, IL, a well respected arts community in the Chicago area, Susan Franke designs her jewelry both at home and in a studio space in the same building as the Piven Theater where John and Joan Cusack, and of course Jeremy Piven, studied acting. 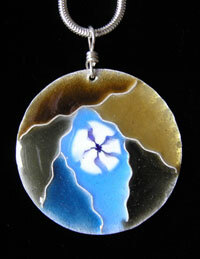 Susan specializes in handcrafted pieces that are both structurally intense and sentimental in nature. Using various techniques including enameling, cloisonne, metalsmithing, bead artistry, and stone setting, her technique is colorful, symbolic and meaningful. With a self-proclaimed ���unusual background��� for a jewelry designer, Susan graduated with a degree in English and Philosophy and worked as a financial aid officer, paralegal, and librarian. Deciding to pursue jewelry making in her 30s, Susan did not have formal training, although she had taken years of classes at the local art centers. Her love for jewelry making began with her first enamel class, when artist Mary Lasky changed her life. With her supportive husband, John, by her side, Susan set up her business and the rest is art history! Susan made me a very special custom piece that combined both my husband���s Irish background with my Asian background. The piece itself had so many dimensions and colors, one could tell Susan put a lot of heart and hours into it. We were able to speak with Susan about her one of a kind business. With such an immense passion and love for her work, it was so nice to find out all about her. Susan, tell me more about the enso pieces that you created. For Mike and I you asked what colors meant something to us. Do you do this for other clients - and what is your reasoning behind these designs? The vibrant, colorful designs in my enamel and cloisonne jewelry are specifically created so that the color itself has meaning to the person who wears my jewelry. Colors, combined with symbols such and a heart, enso, puzzle, etc., give specific meaning to each piece of jewelry that is unique to the person who wears it. For custom orders, I encourage my clients to express what is important to them or have meaning in their life. I will work with them to come up with a beautiful and meaningful piece of jewelry that they will treasure for years. Color can also have less meaning and may be used simply to match your perfect outfit, or because you like to wear a particular color. That is what is so rewarding about creating and designing cloisonne jewelry. 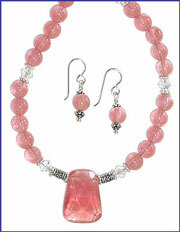 The jewelry can have great meaning or it can just be colorful and fun. The term "cloisonne" means "cell(s)" in French. Thin metal wires separate "cells" of colorful enamel and create a design on metal. 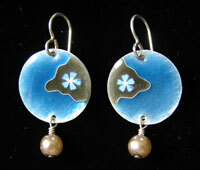 The majority of my cloisonne pieces are fired over fine silver, but some are also made with copper. I am personally drawn to fine silver because the glass is so brilliant over fine silver. Copper will not produce quite the same brilliance. I use fine silver, which is 999 silver, because sterling silver, which is 925 silver, will turn black or melt in a kiln. 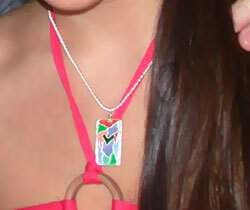 I am unaware of other cloisonne artists who create and design their jewelry in a style similar to mine. I pride myself on being unique in my style of cloisonne. Many enamelists steer away from cloisonne because it is such a labor-intensive process. And most cloisonne artists use gold and other precious metals to create very high-end pieces. Each piece takes from three to seven hours to complete. I find the cloisonne process relaxing and very rewarding. I have always loved color, and the ability to combine color with symbols or designs which have great meaning to someone, is extremely rewarding to me. I am always thrilled every time some one tells me how happy they are to wear one of my designs. The puzzle heart pendant took 6 hours to make. What is the intricate process that you use in creating this gem? First of all, from talking with you, I knew that Irish green was of central importance to the piece since Mike is Irish and he is the love of your life. So I knew that an Irish green heart would complete the puzzle, and be the center of the pendant. Since the heart was the focal point of the piece, I wanted to use about 8 or so other pastel colors that weren't as brilliant as the Irish green, but would complement it and make it stand out. I also wanted to use a lot of colors that would go with many styles of clothes, so you would be able to wear the piece every day if you wanted to. I begin by cutting the silver, filing it, and hand hammering it. I then enameled both sides with clear glass several times to create a base coat. Then, the cloisonne wires are cut and formed by hand, and then placed over the silver. They are fired until they fuse with the base coat of clear glass. Each color of green and pastel transparent glass must be mixed with the right amount of water, and then applied carefully with a paintbrush. 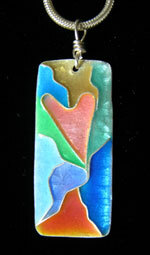 I use transparent glass so that the fine silver shines through the glass to create added brilliance of color. The glass must dry completely, and then be fired in the kiln, at 1500 degrees, for about 2 or 3 minutes. This step is repeated about six or seven times until the color is truly brilliant and the glass meets the height of the cloisonne wires. The piece is then stoned with an alumdum stone over running water, and fired very hot one last time. 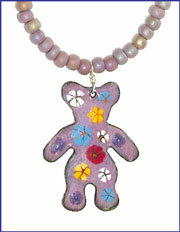 On occasion I love to create a hand made chain to go with my cloisonne pendants. I purchase most of my materials from a supplier in New Mexico called Rio Grande, and Thompson Enamel in Kentucky, since I have found that they have the highest quality materials. It takes approximately an hour to make a wire wrapped pearl chain to accentuate one of my pendants. I do this because it makes my pieces more unique, and you certainly won't see everyone walking around town with a chain like mine. What does jewelry mean to you in terms of what you'd like it to say about the person wearing it? As a former librarian, I am able to research meaningful symbols such as I did for your enso heart piece. I researched Zen a bit and found the enso symbol. Its simplicity was perfect for the piece I was designing for you. I was able to use a lot of graduated color for dramatic effect, but kept the symbolism simple in conjunction with the philosophy of zen. Tell us a little more Susan Franke's early design days. Was getting noticed in the fashion world difficult at first? What ways do you market your business? During the last two years that I was a librarian, I would use part of every paycheck to buy glass and supplies, so I could hit the ground running when I left the library to start my jewelry business. On weekends, I set up my accounting, got my tax i.d., and worked with my fabulous web designer, Glass Griffin Graphics, Inc., who did my web site, photography, business cards, and advertising. Glass Griffin gave me wonderful advice about how to market my new business so I must give them a lot of credit for guiding me in the right direction. My librarian and paralegal skills have been invaluable to me in starting my own business. I am so thankful for that training because I knew how to research setting up a business and conforming to the legal aspects of it as well. Most artists that I have met do not have a similar background to mine and focus strictly on their art rather than on the business and legal aspects as well. As a librarian, everything I worked with was based on information in one form or another. Information is vital to any business whether it be getting your information or product out there, or receiving information that can grow your business. That is where I feel I am different from most other artists, because I approach things differently. I rely on research and information to grow my small business. I don't just rely on the art itself. I enjoy researching appropriate markets for my jewelry almost as much as making the jewelry myself. It is the perfect career for me because I can combine creativity and color with the practical skills I gained in my past careers. Also, as a philosophy major, the meaning behind things is very important to me. Jewelry making presents a wonderful opportunity to combine philosophy with art that is specific to a person's life story. I love that my jewelry has meaning behind it in addition to being a miniature work of art. The first year of my new business was the hardest. But the second year things have really started to take off for me. I'm currently in eight galleries nationwide, and I exhibit my jewelry in 15 - 20 Chicago area and Wisconsin shows each year. These galleries and shows are a craft lover's dream come true. Check out the following links to see where the upcoming shows will take place. What colors do you like to work with the most? Do you have a couple of favorite pieces? The four photos in this article represent some of my favorite pieces. 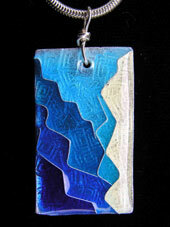 Especially the Greek Beach cloisonne Pendant. I love blue. I read somewhere that enamels are based on the color blue. There might be some truth to that because the majority of enamel glasses are blue.